Looking to Traffic Barrel with 4 Inch Stripes – Trailboss Channelizer Drums, manufactured by industry leader – Jackson Safety, in Rochester NY, Ithaca NY and Western New York? The Duke Company proudly features the highest quality work zone safety barrels from an industry leader. We are widely respected with professional contractors for exceptional service and prompt pick-up and delivery services. 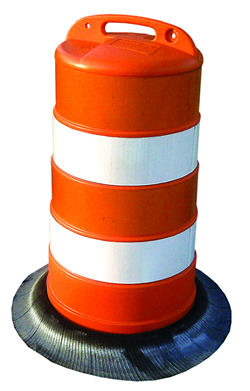 Notably, Jackson Safety manufactures its traffic barrels in the United States of America. Meets and exceed safety regulations. Traffic barrel highly engineered to prevent rolling in the case that there is impact. Several different drum bases are available: HDPE Drum Snap On, 25 pound base, 40 pound base, 22.5 inch tire ring.